Mid-Mountain Materials wins gold in the Emerging Manufacturer for midsize/large firms category. COATING. 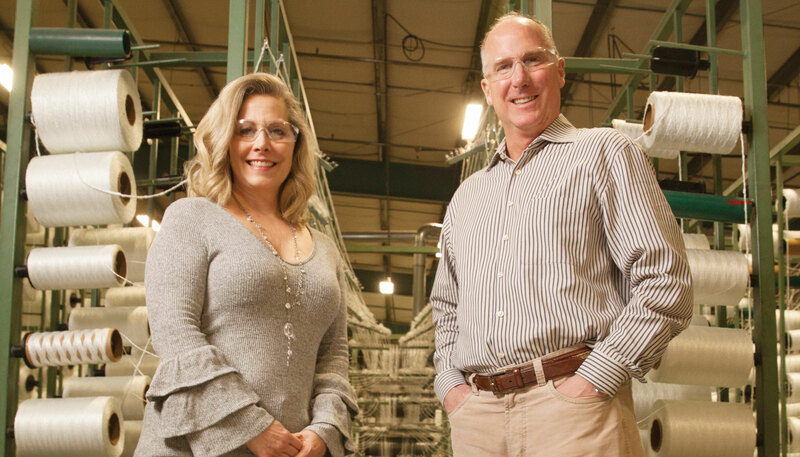 Gretchen Reimbold is SVP and John Knapp is president and CEO of Mid-Mountain Materials. This article appears in the May 2018 issue. Click here for a free subscription. Need a fabric that can stand up to extreme temperature — the kind that might be involved in fires or welding? Mid-Mountain Materials specializes in the coated textiles and fabrics used in harsh, demanding environments where resistance to heat, chemicals and abrasion is of paramount importance. It has made air cargo covers, firefighting apparel, chemical suits, even a supersonic inflatable aerodynamic decelerator for the Mars 2020 Rover. Coming up with new applications is as much Mid-Mountain’s specialty as developing those high-performance fabrics; it developed a geodesic dome tent used in tests of waste-treatment procedures at Hanford. Based in Mercer Island and working from a manufacturing facility in Arlington, Mid-Mountain Materials is seeing increased demand for its products to protect expensive but delicate robotic equipment from the elements. See the full list of winners from the 2018 Washington Manufacturing Awards here.